New York built the world's pioneering elevated railway in 1867. 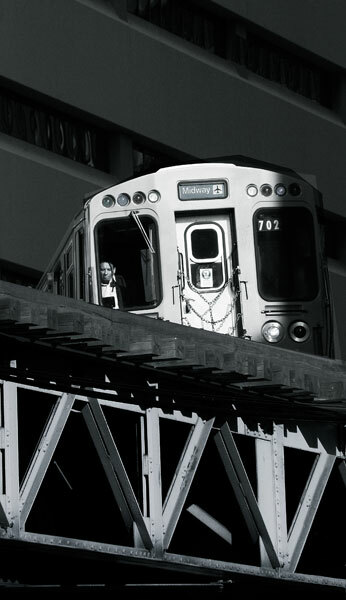 Chicago's first, the South Side Rapid Transit Railroad Company opened in 1888. 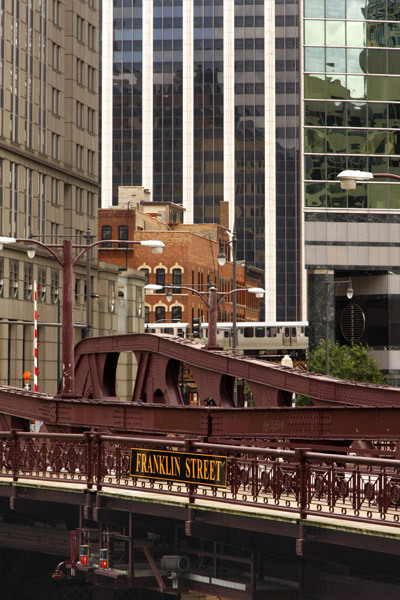 The Lake Street Elevated Railroad Company operated from 1893, linking Laramie Avenue in the western suburbs to a terminus at Madison Street and Market Street (now West Wacker Drive), Viewed from the Merchandise Mart building, a train on the Lake Street L crosses Franklin Street. After the new Lake and State terminus opened the original one at Market Street became a stub terminal. The line was extended to Adams and Wabash Streets in 1896 and in 1897 to Wells and Lake Streets to complete the downtown Loop. 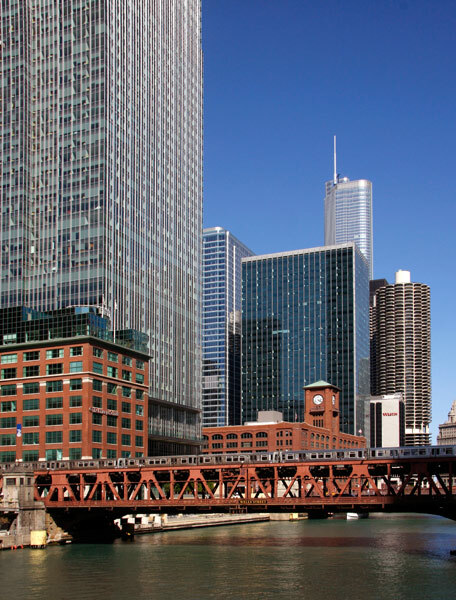 In this image a train appears on the Lake Street Bridge between the 333 West Wacker Drive building of 1983 and the 1912 Great Lakes Building. 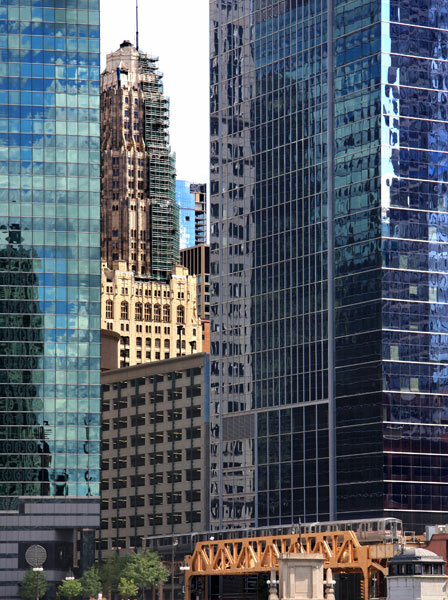 The West Wacker Drive and Lake Street Junction is dominated by the curved façade of the 333 West Wacker building that carries spectacular reflections, particularly in late afternoon sunlight. A train carrying painted advertisements flickers through the bridge steelwork to take a minor role in the composition. When this photograph was taken a few steps away on the other side of the bridge from the previous image the warm tones of the low September afternoon sun unified forms and surfaces as it illuminated the length of Lake Street. It was at this point that the original Market Street tracks turned south down what is now North Wacker Drive. 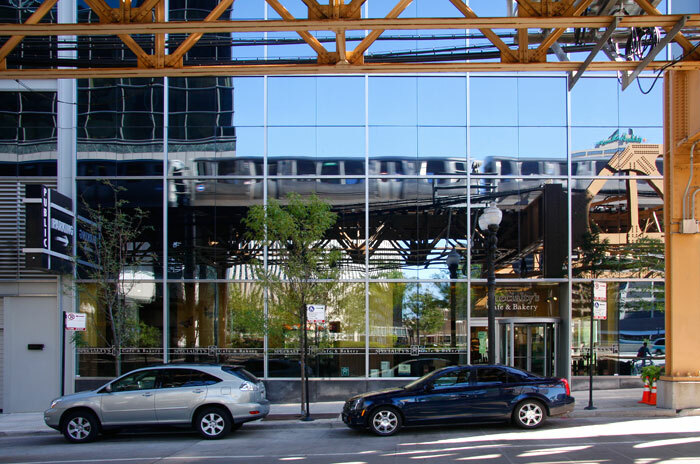 This open space at the junction of the North and South Branches of the Chicago River had excellent afternoon light and few of the problems of wide ranging light levels within in the downtown Loop street grid. The 1967 corncob Marina City building, the neo-gothic 1928 Lincoln Tower and the gilded top of the Carbide & Carbon Building of 1929 are notable buildings in this panorama. In 1904 the stockholders the financially ailing Lake Street Elevated Railroad voted to change its name to the Chicago & Oak Park Elevated Railway Company as part of a reorganisation. In this guise, the line operated until the Company went into receivership in November 1911. Here, a train crosses over West Wacker Drive against the backdrop of the Merchandise Mart building of 1930. 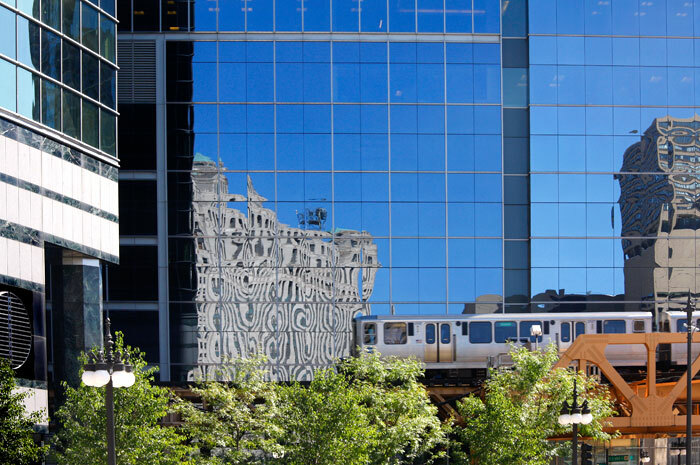 Photographed across the front of Kohn Pedersen Fox Associates' 333 West Wacker Drive building of 1983, a train traverses the side of their 191 North Wacker Drive building of 2002 that carries a façade reflection of the Merchandise Mart across the river. In September 1911 the Company had joined with three other elevated companies to form the Chicago Elevated Railways Collateral Trust as a "voluntary association" to promote a central operating control without forfeiting their independence. 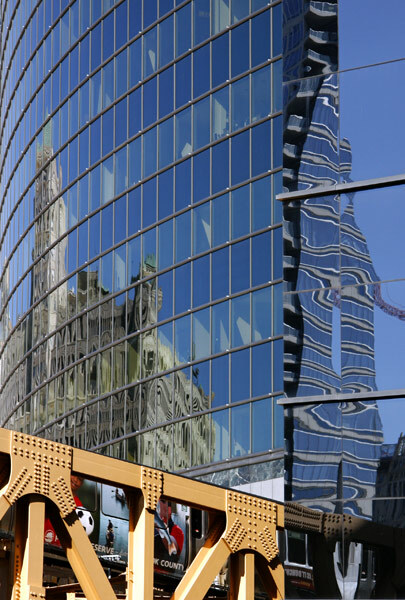 Here, a train running overhead is reflected in the Lake Street façade of 191 North Wacker Drive. Viewed from Canal Street to the west, Wells Street Bridge and the red brick of the 1912 Helene Curtis and the 1913 Reid Murdoch Building are dominated by later glass architecture backed by the Adam Smith SOM designed Trump Tower completed in 2009. After the Sears Tower, this is Chicago's second tallest building at 1389 feet to spire tip. 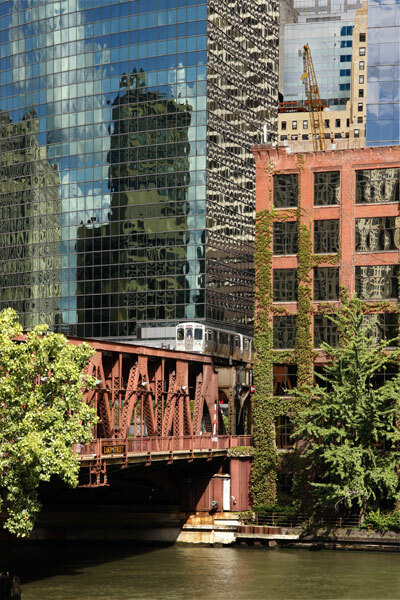 Against the side of the Helene Curtis Building, a train leaves the Wells Street Bridge as it approaches the Merchandise Mart station. 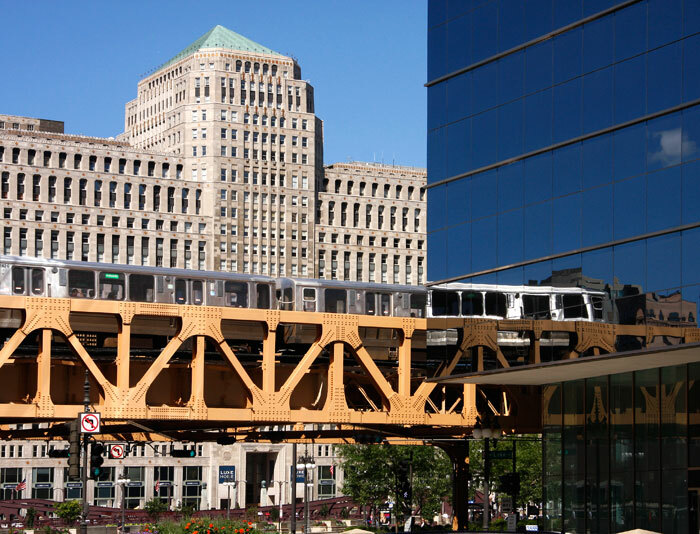 Crossing the painted steelwork of the 1972 CNA Center building, the train approaches the Wabash Street junction and a right turn into Van Buren, the 'bottom' of the Loop, and a further turn into South Wells and on to the Lake Street crossing. 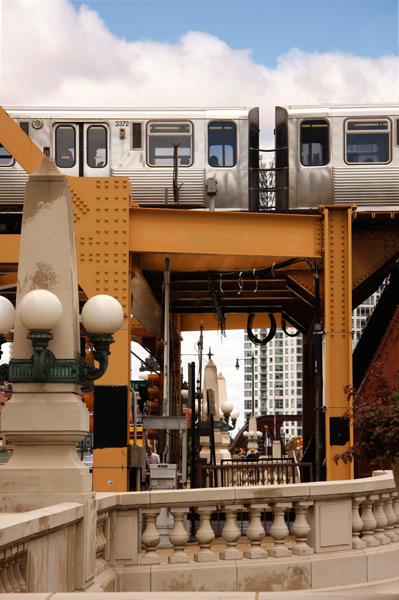 Moving straight ahead would take it on to the 1892 route of the South Side Rapid Transit Railroad Company, the first elevated tracks in Chicago. 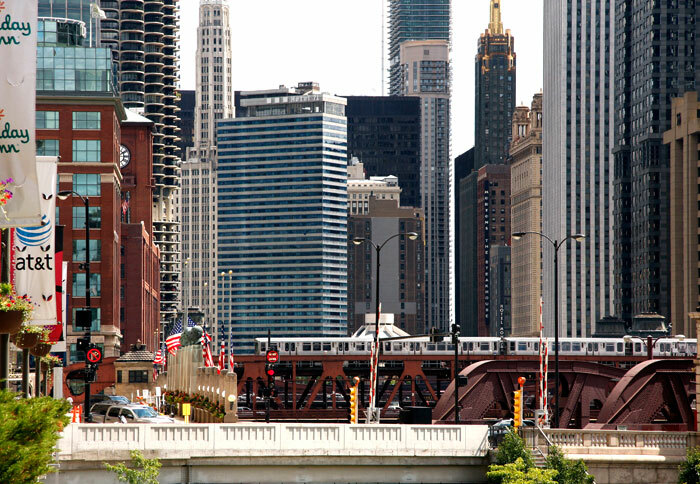 In recent years the promenades on the banks of the Chicago River have undergone major improvements. 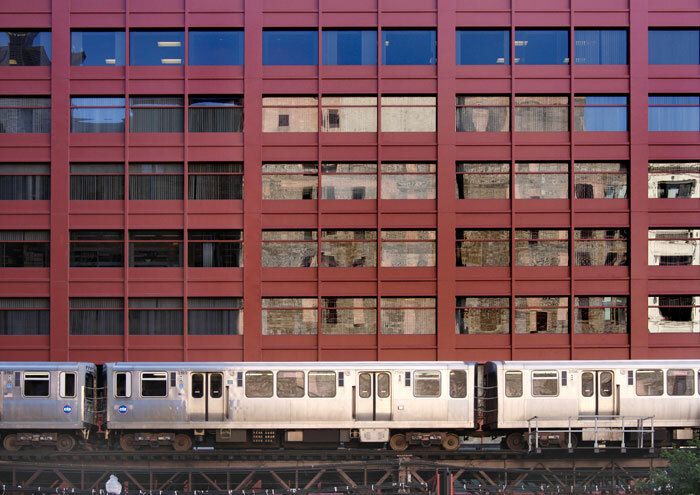 Here, a train leaves the ochre painted land bridge over West Wacker Drive as it heads north over the maroon Wells Street Bridge to the station at Merchandise Mart. 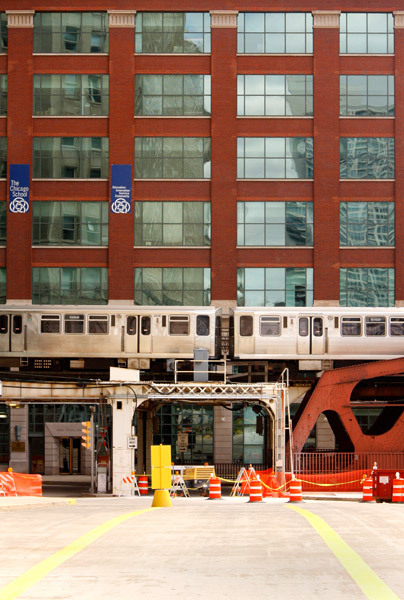 On the north side of the river, a train for Kimball leaves Merchandise Mart station and rolls on to the double-deck Wells Street Bridge. 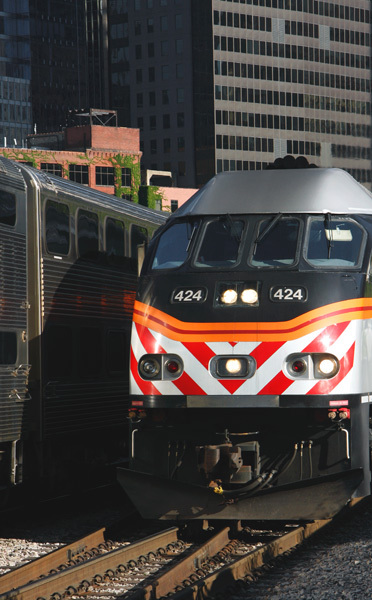 The image was cropped to parallel a printed text based on broadcast passenger car information noted as I travelled the Loop and returned to this starting point. 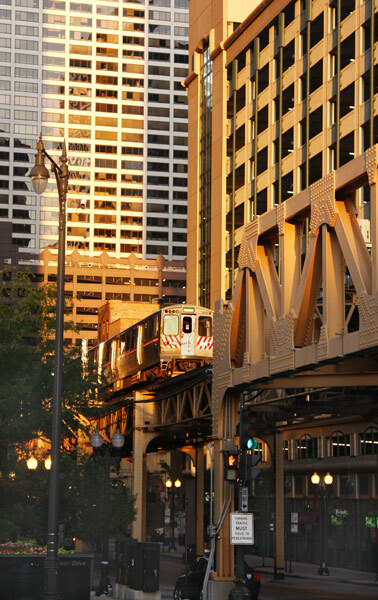 In the first sunlight of a new day, a train to Midway Airport slowly negotiates the north-east corner of the Loop at Lake Street and Wabash, one block east of the 1895 State Street terminus of the Lake Street Elevated Railroad. These early hours can offer deserted streets and bright light and are perhaps the best of the day. 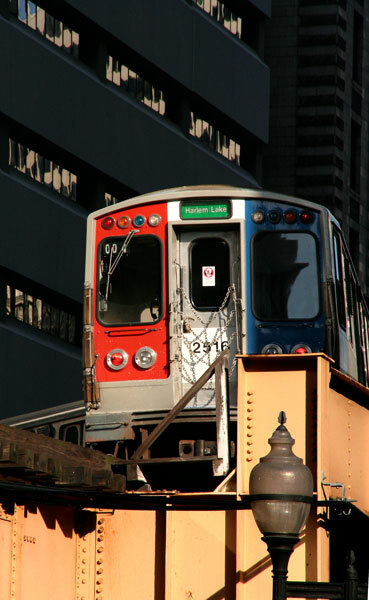 A Harlem Lake train, its driver shadowed to anonymity, meets a brighter sun at the same corner. Drinking coffee in a café on North Wabash Street with trains trundling by overhead was a novel experience. Riding the trains through the downtown glass canyons and over the river bridges parallels later sensations in the Rocky Mountains and the Sierras heading for San Francisco. The 1911 Renaissance Revival style terminal building of the Chicago & Northwestern Railroad was demolished in 1984 and replaced by the Citycorp Center tower that includes a passenger concourse. The original 16-track train shed has been overhauled to shelter some 200 daily train movements. Rush hour arrivals and departures of double-decked trains is an impressive sight. 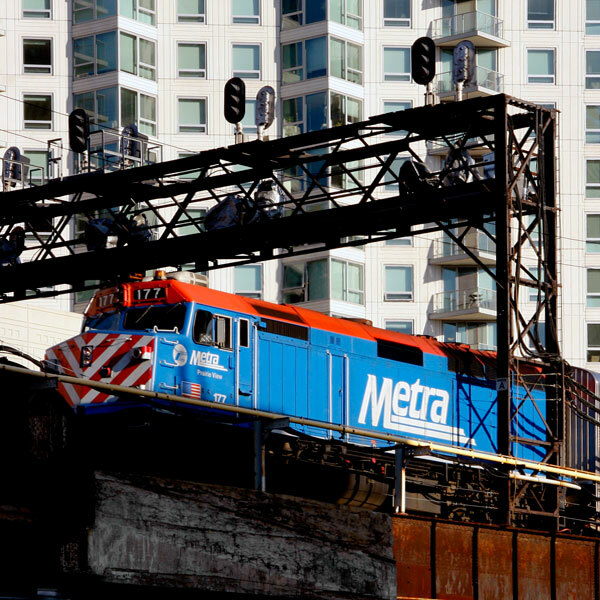 AMTRAK and METRA trains leaving north from Union Station emerge above ground on a curve crossing Canal and Clinton Streets on the level before heading west. This was my exit route on the California Zephyr to San Francisco after a few days in Chicago looking at architecture and design, visiting galleries and bookshops and taking largely architectural photographs.